So what game are you hoping for that would that would be the best convincer to get the PS4? As I said before Mine would be Uncharted 4. Definitely a new Twisted Metal! I know it won't happen but man even as a launch window game that'd be incredible! My interest in the PS4 will largely be the same as it was on the PS3 - third party exclusive JRPGs. Until GUST announces a PS4 game I can't be truly happy. $400 and either Killzone 4, inFamous 3 or Uncharted 4 at launch would sell me on the system. I'm not expecting inFamous or Uncharted to be honest, but I could see Killzone happening. I just want new IP. 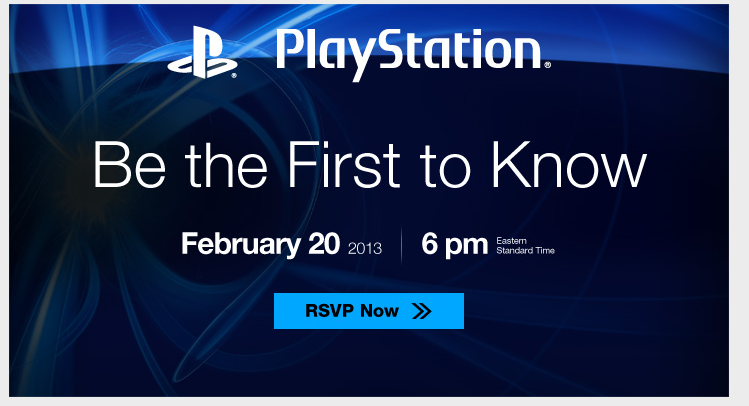 I'll be skipping the PS4 either way, but I am interested to see what it does. I'm trying really hard to not get excited for this. Since I don't think I'll have money for two consoles this generation. I also have just now started getting into my PS3. At least, not if its "599 US Dollars"
Anyways. Unless they say "Kingdom Hearts 3! Exclusive for Playstation 4!" I might be skipping it. Still, a new system, not to mention a new Playstation, is always exciting. I don't care if I favor Nintendo systems in all other regards. Ha ha ha ha ha. This made me laugh so hard. When is the event Central Standard time? Oh! Sweet! Only 1 more hour! They're sure making the PS4 sound cool right now. Damnit, Sony! When the Nintendo Fanboys said, "watch Sony announce a touchscreen in their controller," they were joking! That's not what they were hoping for! That's not something that would make it appealing to them! Ugh...at least it looks a lot less bulky than the Wii U controller, but now the touchscreen seems too small...and I still don't think they needed one in the first place. Geez, from now on, if anybody says Sony copies Nintendo, they won't see any complaints from me. All joking aside, even though I haven't seen the stream (all sites are down), the reactions in chat are plenty enough for me to draw my own conclusions. Geez, from now on, if anybody says Sony copies Nintendo, they won't see any complaints from me. Sony copies Nintendo. Sony copies Nintendo. Sony copies Nintendo. Ugh...at least it looks a lot less bulky than the Wii U controller, but now the touchscreen seems too small...and I still don't think they needed one in the first place. So despite being a PS4 thread, what are you thoughts on the Wii U GamePad? An x86 architecture? Sweet! That could be good for the PC games industry. 8GB of rams sounds like a lot though. Sounds like either their OS is a resource hog or it can easily handle multitasking. If the OS's supposed to be very flexible, then it will hopefully have an intuitive interface. EDIT: Seriously, they've incorporated too much motion graphics into the video in my opinion.